A book may be exported to a zip file from Moodle, and may then be imported back as individual chapters added to an existing book. 3. Click Edit next to the Book you wish to edit, then click Edit Settings. 4. 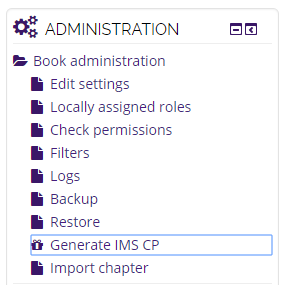 At the Administration block on the bottom left, select Generate IMS CP. 1. 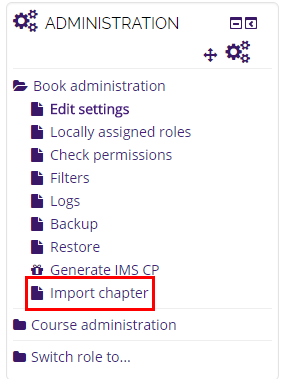 Click Import chapter in the Administration Block on the sidebar to the left. 2. Select Each folder represents one chapter. 3. Click Choose File or drag and drop your zip into the box, and then click Import at the bottom right to save. 4. Click Continue once you have finished. 5. Your original chapter will be displayed. 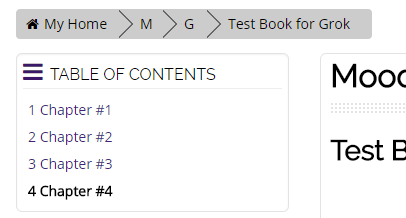 In order to see the new chapters, you can select it from the Table of Contents at the top left. 6. For more information, please see https://docs.moodle.org/33/en/Book.